successfully hosted in Koguan Building. The annual meeting theme is “Judges, court and rule of law”. Several academics from Peking University School of Law and University of Hong Kong participated in the annual meeting of Law. Zhang Shouwen, Dean Professor of Peking University Law School gave a Speech about Annual meeting theme background and welcomed academics from Hong Kong. Then He Yaoming, Law School Dean of the University of Hong Kong, gave a Speech. Fu Hualing who is the Professor of University of Hong Kong hosted the first field report. Wang Xixin, Peking University Law School Professor published a report entitled“ ' Rebalancing ' of judicial power and the executive power—— <Administrative Procedure Law> Revised assessment”. Michael C Davis, Professor of University of Hong Kong；Gan Chaoying, Peking University Law School Vice Professor； Ye Baoren，Professor of University of Hong Kong then gave speeches successively， and discussed. The second report began after the coffee break, Professor Ling Bin, Professor Zhang Qi and Dr. Liu Zhewei of Peking University Law School expressed their opinions. In a panel discussion started again. The third annual report began in the afternoon in Koguan Building. 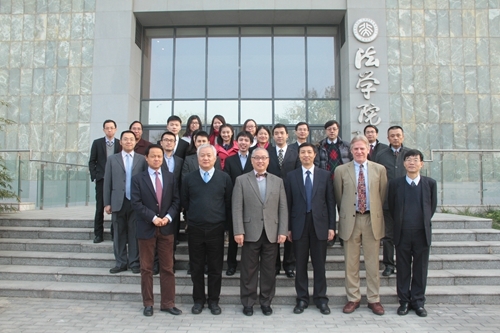 Hong Zhao, Professor of Law University, hosted the field report. The forth report followed by Brainstorming and discussion.The fifth report started in Koguan Building Room 307 on Nov, 22, 9:00 a.m, and the last report followed by a short coffee break. In the last comes the Closing Ceremony. Fu Hualing, Dean Professor of Hong Kong University Law School gave a speech. Xue Jun, Professor of Peking University Law School, gave a subsequent speech. The annual meeting in plenary session focused eighteen senior 's " rule of law", conduct a comprehensive analysis and depth of our judicial reform process. Annual Meeting of Peking University Law School and School of Law, University of Hong Kong to build a platform for academic exchanges, in favor of Argue of a different idea of jurisprudence clash, has great significance to the progress and development of Peking University and Hong Kong University Law School.